In Brighton for the first time in weeks, laid up - in particular, because of recovering from dental anaesthetic. Tooth trouble, and more to come - root canal etc. which may or may not work. In the dentist's room I try to have the conversation (he being new to me and my Condition) about M.E. and after-effects of things like anaesthetic and antibiotics. He picks up that something, at any rate is amiss (I had seemed so nice, grateful, amenable), and fears that I might be about to make some kind of scene. He doesn't begin to have a clue what I am on about. Never mind, for something has to be done, whatever. I am bruised and super-myalgic from injections, and the rogue nerve is still in me causing toothache. More treatment and injections next week - a two-hour appointment, but at times like this toothache is king. The food regime continues, after a fashion, though it scarcely seems possible to be eating vegetables plus prescribed amounts of protein and carbs every two hours (to calm the blood sugar situation, to alkalinise the environment that is me). So I cheat, with spelt crackers and oat cakes. What? Those plus hummus and a carrot stick equal carb, protein and veg. Today's fish and chips at lunch do not, but give me a break. The cup of decaf tea with milk and a knife-end of honey is also not kosher, but I am in dire need of the small comfort it gives me - and it washes down the Anadin I have just swallowed. Son of Signs is in Trinidad right now, where the warm rains come down monsoon-like for a short space most days. Brighton monsoon rain is a more dreary affair, but still, it caught my attention this afternoon. 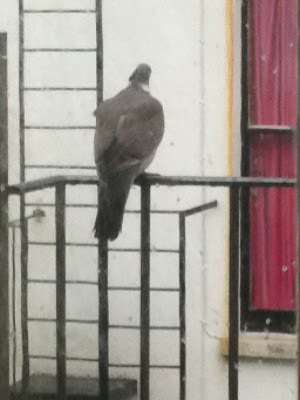 A lone pigeon was sheltering on the railing outside the bedroom window and giving me the eye. We kept each other company for a good half hour until I asked Mr. Signs to take a photograph, and then it turned its back. 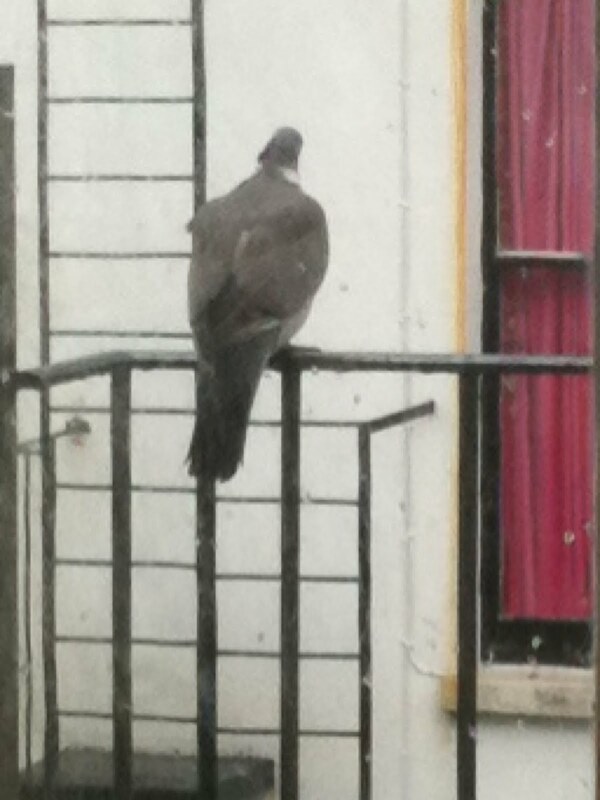 So much for feathered friends... Thinking of you, Signs. Frustrating, when everything mucks up everything else. :O(((( Not nice at all. You need some arnica for the bruising and some hypericum every 3 hours for the injection site and alternate ibuprofen with aspirin (but dont go over recommended dose of either in 24 hours) Pharmacist told me the latter when I had my wisdoms out and worked well. I'm doing the homeopathy but should also have included Thuja, I think, to help the stuff get out of my system. After-effects of anaesthetic is what I need an antidote for, and there isn't any. Ah yes, I forgot about the Phossie - it did help me somewhat before. Thanks, Doc. And while you're here - would you alternate the gelsemium with the phos? (you could be earning a nice amount at homeopathic helpline, you know). Yes I think I would...and the arnica too and keep up the hypericum cos its brill for injection sites and also calming everything down re anaesthetic. Good luck with tooth. I wish our teeth were truly immortal. Yes, had lots of acupuncture in the past. Last time it had a very bad effect - system not strong enough to use it well - I was advised to leave it.